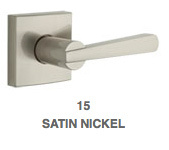 Collections by Weiser™ offers many distinctive door handles, one of them being Vandagriff. Some levers are "handed", which means you need to consider which way your door swings for the lever to curve up or down in the correct direction. Weiser levers are fully reversible so they're easy to install and give you one less thing to worry about. TThe Vandagriff lever is stylish and modern with small details that differentiate it from the other Collections levers. It has a Grade 2 certification by ANSI/BHMA (American National Standards Institute/Builders Hardware Manufacturers Association). The Vandagriff lever also features Weiser SmartKey® re-key technology. This allows you to re-key the lock yourself in seconds (depending on the function). 101: Passage/Hall/Closet - Both levers are always free. 331: Privacy/Bed/Bath - Both levers can be locked or unlocked by a turn button inside. The outside lever can be unlocked by an emergency key. 535: Keyed Entry Lever - Both levers can be locked or unlocked by a key outside or a turn button inside. 12: Inactive trim, surface mount or bolt through - For doors where only a pull is required, no operation.